In many respects, the X-Men seem to have a golden touch in the realm of entertainment. The 1990?s cartoon series was one of the most epic, sweeping, and mature products ever to grace Saturday morning television, appealing as much to adults as it did to children. The X-Men movies of the last five years have been equally good, with X-2: X-Men United arguably one of the best superhero films ever made. Unfortunately, most X-Men video games have not lived up to that high standard, being either poorly-conceived action games or bland street-fighters. Raven Software, however, had a sweeping vision of an epic action-adventure game with squad-based combat and role-playing advancement elements, supported by a deep plot that was faithful to the license. All of this, and more, has been realized in X-Men Legends. Long but never dull, fast-paced but strategic, action-oriented but with nice role-playing elements, four-player-enabled but a blast by yourself ? this game is just plain great. Set in the X-Men Ultimate comic book universe, and penned by a collection of former X-men authors, X-Men Legends is for real. Legends is a pretty long game, spanning upwards of 25 hours. Legends employs both role playing conventions (i.e. leveling up and experience points) and action conventions (i.e. combo moves, auto-targeting, and a ?Final Fight-style? enemy energy bar). Taking a nod from games like Baldur?s Gate: Dark Alliance, leveling up allows you to unlock or upgrade various mutant powers and abilities, ranging from Wolverine?s mutant healing powers to Rogue?s superhuman strength. Leveling up also lets you increase your character?s basic abilities, including body (your hit points), agility (your defense rating), and focus (your mutant energy points and recharge rate). For those who hate RPG micromanaging, the game will auto-distribute these points for you, should you wish. The excellent plot in Legends is played out through the eyes of Alison ?Magma? Crestmere, a young mutant working her way into the X-Men. You can be sure that a large section of the X-Men universe, including a total of 15 X-Men and such staple foes as the Brotherhood of Mutants and the Sentinels, will find their way into the game. The story weaves them all together beautifully and convincingly, and more than once I wondered I was reading a graphic novel as much as playing a game. The came can be that immersive. The main campaign can be played single-player or cooperatively, and additional players can be brought in or sent out with ease. I had a friend come over while I was playing, and a simple click in the game?s pause menu allowed him in. Just as easily, returning to the pause menu will allow you to deactivate one of the controllers. All consoles support up to four players simultaneously, though the Cube and Xbox versions are inherently better-suited for such gameplay. Be forewarned ? 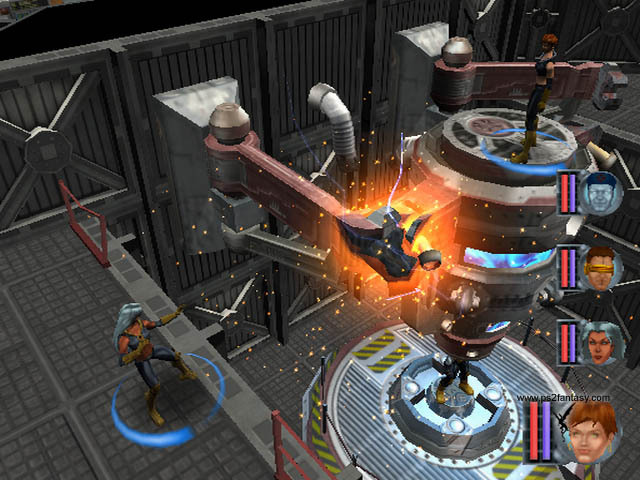 there are a couple of missions that only allow for one player, at least through part of the mission, and a couple of others that never top two or three X-Men, so choose those four-player get-togethers carefully. Gameplay begins and ends in the mansion, and the game offers a sizeable number of gameplay options almost from the start. The player can roam the mansion and survey its extras (more on that a bit later), interacting with other characters and learning about the past and present world of the game. If you are looking for combat, you have three major options: the Danger Room, flashback missions, and the main missions. The Danger Room is full of different scenarios and exercises, many of which are part of the game?s main plotline. There are dozens of training programs that range from single-character challenges to group exercises. They are great for learning the ropes in Legends, and they also yield valuable experience points for the purposes of leveling up. Danger room exercises also yield the same items available in regular missions, making them potentially lucrative as well. (As an aside: outside of the main campaign, the game allows for ?sparring? and ?skirmish? modes, allowing you to team up with friends or face off against them in a Danger Room situation. You can even customize your locale, enemies, and various other settings to your liking.) The flashback missions, which occur a few times through the game, allow you to go back and replay some of the more famous past adventures of the X-Men, including Juggernaut?s attack on the X-Mansion. The game?s plot places these events into the past, thus creating a connection between the game and X-Men lore. At the same time, the game generously allows you to accrue items and experience through the flashback missions, so you get to take all that experience goodness back with you to the present. The main missions are the bread and butter of the game, and span numerous locales. Many of the venues will be familiar to X-Men fans, and all of them offer unique challenges. They are the primary vehicle for the game?s hefty plot, and are interlaced with some cutscenes to flesh things out. Most missions allow you to take along any X-Men you have unlocked to that point, while some others limit your choices. The more limited-option missions are actually some of the coolest in the whole game ? but you?ll just have to see why for yourself. In all types of missions, there are a variety of items you can pick up. Tech bits are the game?s currency, and can be exchanged for items and such as the game progresses. You can also collect health packs, energy packs, and various items that can be equipped by your team. You can turn around and sell this equipment, or buy additional stuff from Forge and a Morlock Healer through the game?s Xtraction (save) points. What impressed me the most about this game was how it does the little things well, including: good ally AI that can be reasonably customized; highly destructible environments; on-screen warnings when a character?s health gets low; circles around the X-Men to make them more easily-identifiable; clever cameos by other characters in the X-Men universe; and some nice variety in the style and aim of the missions. The game also has an obscene amount of extras about in the X-Mansion, from unlockable concept art to artifacts in each character?s room that give interesting insight on that character?s backstory. Fans of the comics will also appreciate the trivia game you can play. And the best part is that these extras often have direct application to the main game. Answering trivia questions correctly nets you experience points, and unlocking comic-book covers yields statistical bonuses to the character featured on the particular cover found. So not only are these extras really fun to collect, but they are actually important in helping to beef up your characters come combat time. There are a few cons to be aware of in the gameplay department. One, in a few places the game opts for ?instant-death? falls, and although the AI does okay keeping a wide berth of these precipices, an improper nudge will occasionally send one of your computer-controlled teammates into oblivion. Two, the game does not offer online capabilities. This second issue is perhaps unavoidable, given the fact that some missions only call for one to three X-Men, but those who got a fix playing Norrath online with others will have to find help within their own living rooms. The graphics are generally good, especially while in combat. The battle engine is runs very smoothly even with a great deal of mayhem going on. The cel-shaded characters, while not quite up to snuff with the work done in Capcom?s Viewtiful Joe or Namco?s Tales of Symphonia, are still acceptably good and are very appropriate for the comic book world. The characters are not overly-detailed, and look a little on the rough side from close up, but in battle they look great. The special effects are also great, and in later levels the top-level mutant attacks are real eye candy. The scenery is generally colorful, detailed, and diverse. Cutscenes, meanwhile, are a mixed bag. The game has several FMV sequences that look great, with nice lip-synching and some flashy effects. Some of the cutscenes using the in-game engine, on the other hand, tend to expose the lack of close-up character detail and are a borderline eyesore. The music in X-Men Legends is really solid, if a bit understated. In a way oddly appropriate to the X-Men property, the music doesn?t take any big risks but doesn?t really make any mistakes, either. All of the tracks are nicely appropriate and ambient without being annoying. The ethereal X-Mansion soundtrack is particularly cool. Sound effects, likewise, aren?t overwhelming, but are appropriate. Wolverine?s claws and Cyclops?s optic blast sound just like you would expect them to, and explosions, punches, and beam weapons sound good. Most of the game also contains voicework, and it has a lot to live up to, given the excellent voicework of the cartoon and the good acting of the movies. In this context, Legends isn?t Oscar material, but it holds up okay. Patrick Stewart?s voiceovers in Star Trek games (Bridge Commander, Starfleet Command III) were often a bit on the uninspired side, and although Legends isn?t his finest acting, he nevertheless turns in a more respectable performance as Charles Xavier than he ever did as Jean-Luc Picard. This is good, because Stewart has extensive voiceover work throughout the game. As for the rest, most of the voice acting is good. Cree Summer gives a really good performance as Alison ?Magma? Crestmere, and Armin Shimerman (Quark from Star Trek: Deep Space Nine) does a fantastic rendition of Toad. The rest of the cast does a pretty good job, and more often than not sounds exactly like they are supposed to, particularly the voices of Wolverine, Cyclops, and Beast. Magneto is a little hard to get used to, since he is not voiced by Sir Ian McKellan, but his replacement, veteran voiceover artist Tony Jay (best known as the Elder God in the Legacy of Kain series), acquits himself nicely. The controls are easy enough to use from the get-go, but complex enough to allow the opportunity for game mastery. They are also pretty solid and responsive. Basic attacks, as well as mutant powers, are easily accessed, and your allies can even be summoned to your aid with the single press of a button (L on the GameCube). The controls allow for both light and heavy melee attacks which can be linked together to form some very nice and deep combination attacks. Depending on the specific character, the games controls also allow for easy access to jumping, throwing, grappling, flying, and manipulating consoles in the game environment. A single touch of a button (the directional pad on the Cube) conveniently allows you to switch X-Men on the fly. The camera, which works pretty well, is accessed on the Cube with the C-stick. In short, the controls are superb and do almost anything you would want them to. There are a couple of minor control gripes. First of all, Legends does not allow controller customization. This is not all bad ? the controls are well-mapped as it is ? but it still would have been a nice touch. The second issue is specific to the GameCube? because the Cube controller has one less button to work with than the other consoles, one of the in-game actions (replenishing your mutant power energy supply) requires the use of two buttons (X+Z). This can be slightly awkward at first, although with practice it becomes easier to do. Legends is rated T for violence and blood, although I don?t recall seeing any real blood. No profanity, either. Violence, on the other hand, is the staple of this game, though that should probably surprise no one. Also of no surprise to those familiar with the comic industry are be the well-toned physiques in tight clothing that make up the X-Men. Additionally, nearly all the women of X-Men Legends also seem to have inexplicably taken on a new style of midriff-baring apparel that is more revealing than is probably needed (or practical, considering the life-and-death combat the girls are always in). Overall, the game contains about as much potentially offensive material as its movie counterparts, approximating the content of a PG-13 movie. A lot of the moral and religious issues explored in the game should ring familiar to X-Men fans. The issues of good and evil, war (Magneto) and peace (Professor X), and faith (Nightcrawler) and reason (Beast) are all explored. As usual, the game delves significantly into the area tolerance and its bearing toward mutantkind. In contrast to the movies, though, the game pretty much steers clear from evolutionary discussion, so Christians who have misgivings about that topic won?t find it here. In reviewing this game, it is hard not to make comparisons to other cooperative action RPG?s like the Baldur?s Gate: Dark Alliance series or Champions of Norrath: Realms of Everquest, especially when many of the conventions of X-Men Legends is so similar to those two games. But X-Men Legends travels so far beyond where either Dark Alliance II or Norrath was willing, or perhaps able, to go, that the comparisons are almost unfair. Legends is, in my view, a far superior experience to either of those games. And those wondering if this game is as good single-player as it is multiplayer, be assured ? the answer is a resounding yes. This game won?t floor you from a technical standpoint, which is why its score is what it is, but it?s still perfectly at home in the current console generation and still looks and sounds really good. This game is easily recommendable for any fans of action games or role-playing games, and its availability on all major platforms leaves little room for excuses. It’s the Big Game, Charlie Brown!